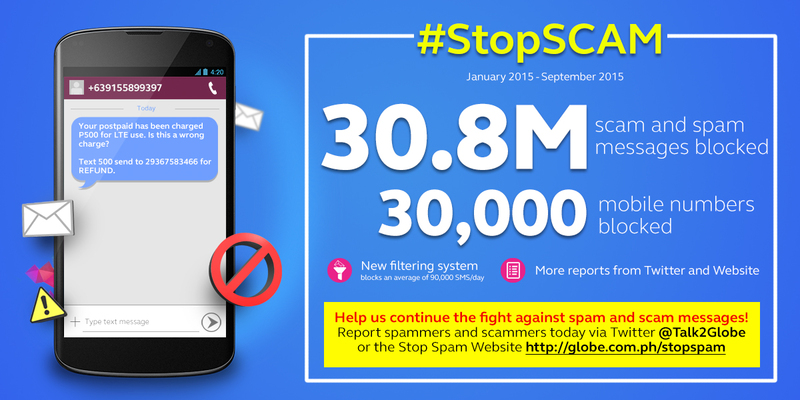 So far, Globe already blocked a total of 30.8 million of spam and scam text messages. The system prevents the transmittal of scam messages to mobile devices, has substantially reduced the number of text scams/scams going through the Globe network. The volume of messages blocked by the network filtering system averages about 90,000/day, reaching a peak of around 200,000 in July this year. The filtering mechanism can be reconfigured to address the kind of spam and scam messages that goes through the Globe network. Recently, bulk of spam and scam messages delivered to Globe customers originate from sim cards of competition (with prefixes 0922, 0943). Mobile customers of Globe Telecom reached 48.4 million at the end of the first half, a 13% rise from 42.7 million a year earlier.